5 WIRE SOLENOID / ACTUATOR / MASTER DOOR MOTOR. A quick and easy repair job for any car door or boot whose Central Locking has failed. 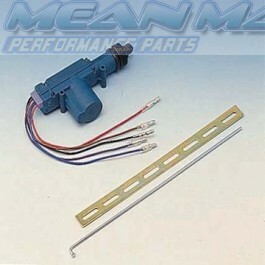 The 5 wire unit is a control solenoid and will close your other doors' locks also. A: This is a universal aftermarket solenoid, used to fix broken solenoids or to fit central locking to vehicles without any. Garages often use these in place of the more expensive manufacturer specific units. If you are replacing the driver side door solenoid, a 5 wire may be best as it will also control the other doors' solenoids; http://www.meanmachines.biz/store/central-locking/solenoid-actuator-kits-and-accessories/5-wire-solenoid-actuator.html We also sell a complete kit to replace your entire central locking system; http://www.meanmachines.biz/store/central-locking/solenoid-actuator-kits-and-accessories/central-locking-solenoid-actuator-kit.html Instructions on how to dismantle your door cards should be available in a Haynes manual.